In 1999, at the height of the Y2K crisis and under the strain of record gold demand, the U.S. Mint produced 2,055,000 1-ounce gold American eagles. In 2008, with the world embroiled in an unprecedented economic crisis and once again under the strain of record gold demand, the U.S. Mint produced only 710,000 1-ounce American eagles and 189,500 1-ounce American gold buffaloes -- just under half its 1999 production. The Mint's ability to keep up with demand in the ramp-up to Y2K played a key role in suppressing premiums on bullion gold coins. The Mint's inability to keep up with demand in 2008 drove premiums to the double digits at one point and helped add 2 percent to the baseline cost of gold coin acquisitions in 2009. When the American eagle shortages first cropped up in August 2008, the Mint blamed the problem on its vendors, saying they were "not able to supply enough 1-ounce gold bullion blanks to meet the unprecedented demand we are experiencing." The Mint promptly thereafter suspended all sales of the popular 1-ounce coins. To understand the full implications of the Mint's production problems, two important pieces of information need to be taken into consideration. First, all the 1-ounce gold blanks purchased by the Mint now come from one refiner in the western United States. Second, with global refiners already running at capacity, Mint officials' attempts to line up additional blank manufacturers are likely to be rebuffed. The prognosis under the circumstance is not a good one: The problem appears chronic and unlikely to resolve itself any time soon. 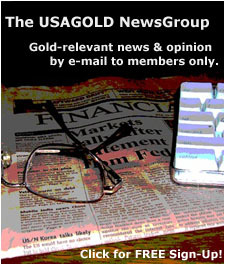 If you would like to broaden your view of gold market news and analysis, please feel welcome to join our free NewsGroup to receive by e-mail periodic gold news alerts and USAGOLD Market Updates with relevant commentary like this one. Unlike the Y2K event, which resolved itself as soon as New Year's Day 2000 came and went, the current strong demand is the result of a secular gold bull market deepened by the worldwide economic crisis. As such this is a whole new ball game for the gold market. Typically, in past bull markets the principal market driver was supply and demand for the metal itself. In the current bull market, it looks like there will be an additional driver to the price paid by those acquiring gold -- the premiums added to the price because of the combination of burgeoning demand and the diminishing supply of gold coins. The role played by gold premiums -- the add-on paid over the melt value of a gold coin -- is little understood and frequently overlooked by gold investors. Usually, premiums remain relatively constant and cover the costs of minting and marketing the coins. When coin supply and demand get out of kilter, rising premiums are the mechanism that restores balance. 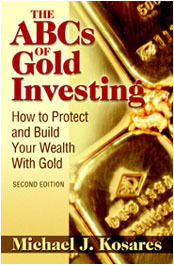 The bad news is that rising premiums can add significantly to acquisition costs for gold consumers. The good news is that rising premiums can add to the profits for those who already own gold coins and for those who were farsighted enough to buy early in the process. A historical precedent can be found in the gold market of the late 1960s. 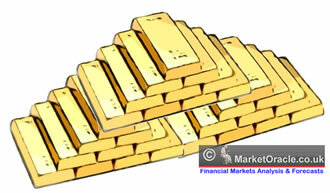 At that time gold was pegged at $35. As the dollar crisis of the late 1960s and early 1970s unfolded, investors globally began moving into gold coins like the U.S. $20 gold piece, the British sovereign, the German 20 mark, Swiss 20 franc, et al. Though the gold price itself was fixed, premiums on gold coins were not. The demand drove premiums on these coins to unimaginable levels -- in some case four to five times melt value. We got a whiff of that sort of thing when contemporary gold coins briefly reached premiums of 12 to 15 percent at the height of the gold rush in 2008. (Pre-1933 gold coins went to premiums in excess of 20 percent.) Once the market settled down, though, a base premium 2 percentage points above normal remained. If the mints are indeed boxed in by the blanks problem, and it appears they are, there will be no easy way to keep those base premiums in check over the long run. It appears that the bullion gold coin shortage has become a chronic problem and something gold owners and accumulators will need to keep an eye on in the months to come.